In India, the Securities and Exchange Board of India (SEBI) instituted Depository Services, called as Dematerialization of the listed securities with the aim of accelerating the share transfer function from sale, purchase and transmission. Dematerialization implies the activity of transforming the physical shares into electronic form. The shares are transferred to the investor’s account, through the depository participant. After the dematerialization of securities, the investor has the option to convert the securities into physical form, through the process of rematerialization. The organization that holds shares in electronic form and offers services related to securities transaction is Depository. 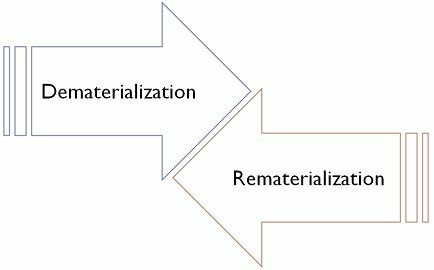 This article presents you all the differences between dematerialization and rematerialization, have a look. Meaning Dematerialization refers to the act of transforming physical shares to an equivalent number of shares in electronic form, into the investor's account. Rematerialization connotes the act of converting the shares held in electronic mode, in the investor's account, into shares in physical form. Dematerialization can be defined as the process in which, at the request of the investor, the company takes back the traditional share certificates of the investor, and same number of securities are credited to his/her trading account in the electronic form. Shares in dematerialised form do not contain the distinctive number. Moreover, the shares are fungible in the sense that all the shareholdings are identical and interchangeable. 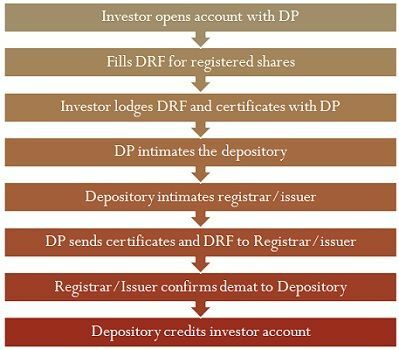 First of all, the investor needs to open the account with the Depository Participant (DP), after which the investors request dematerializing the shareholdings through the DP so that the dematerialised shares are credited to the account. Dematerialization is not compulsory, the investor is allowed to hold the securities in physical form, but when the investor wants to sell it in the stock exchange, he/she needs to dematerialize the same. Likewise, when an investor buys shares he/she gets the shares in electronic form. As and when the shares are dematerialized, their independent identity is lost. Further, separate numbers are allocated for the dematerialized securities. Rematerialization may be understood as the process of mutating the electronic holdings in a demat account, into paper form, i.e. conventional certificates. 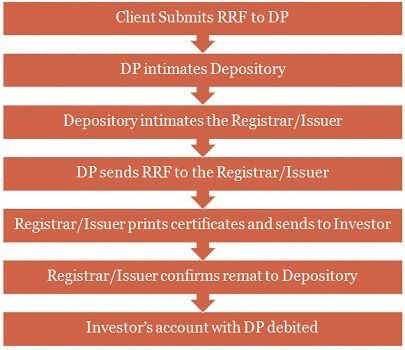 For this purpose, one needs to fill the Remat Request Form (RRF), and submit it to the Depository Participant (DP), with whom he/she has a demat account. The rematerialization of the securities can be done at any point of time. In general, the completion of the dematerialization process takes 30 days. Those securities which are under rematerialization cannot be traded in the stock exchange. The process of conversion of securities from physical form to an equivalent number of shares in electronic form is known as dematerialization. On the contrary, the process of obtaining physical certificates of the securities held in electronic form is called rematerialization. When the shares are dematerialised, they lose their independent identity, and so they do not possess distinctive number. On the other hand, rematerialized shares have their distinctive number. Dematerialization can lead to paperless trading, whereas, rematerialization involves physical trading. In dematerialization, the securities account is maintained with the depository participant. Conversely, the securities account is maintained by the company in case of rematerialization. Rematerialization is diametrically opposite of dematerialization, which allows an investor to turn its shareholdings in electronic form into physical one. Both the processes need at least 30 days for completion.